Home » Cost » How much does college usually cost? WHAT EXPENSES CAN I EXPECT IN COLLEGE? Going to college doesn’t just mean the cost of tuition that schools tell you up front. It’s a mix of many different things, all of which cost money. Your costs will change by where you choose to attend school and how much you spend on general expenses, but when you learn how much you’ll have to spend, you’ll be able to plan for the future more easily. Tuition and fees: these are the basic costs for college that pay for your classes and related mandatory fees. Tuition and fees represent about 38% of the cost of college.is this updated? Housing: these costs cover where you’ll live. This could include on- or off-campus housing, and takes up about 41% of the total you’ll spend on college, on average. Books and supplies: you’ll need these for classes, but they aren’t included in your tuition and fees. These are going to be roughly 6% of your college costs. Transportation and Other: you’ll also need to plan on the miscellaneous things you spend on regularly — clothes, travel and other things like that. This is estimated at about 15% of your total spending in college. Your own costs while attending college will be unique to you, so it’s best to find out what you’ll have to pay to get a college education. With the Indiana College Costs Estimator you can enter in some information about your family’s money situation as well as information like your grades and when you’ll graduate, and you’ll find out what your net price to attend an Indiana college is. The net price includes the money you’ll save with programs like financial aid, so the number you see is the amount you’ll still have to pay. 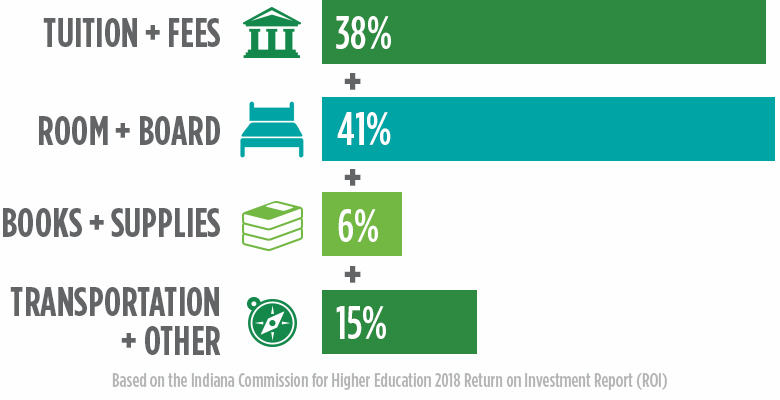 The Indiana College Costs Estimator also lets you see side-by-side comparisons of costs at different Indiana colleges, and create “what-if” scenarios to see how the results can change as your circumstances change (financial, academic, etc). Considering a college outside Indiana? You may be able to calculate your net price of attendance with the Net Price Calculator. Getting a college education can lead to you making more money in your career and throughout the rest of your life. Use our interactive College Return on Investment tool to see how your degree can affect your income based on the college you attend and what you study.